T-Mobile SDA Windows Mobile smartphone is based on the HTC Tornado design which is also shared with the i-mate SP5m. 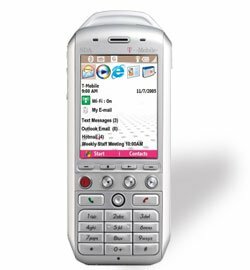 The features of T-Mobile SDA is pretty much the same with Cingular 2125 and other devices based on the HTC Faraday, with added advantage of 802.11b WiFi. Other features include a 1.3 megapixel camera with video capture, Bluetooth connectivity and EDGE.